Dave Joyner is neither a villain nor a hero in the grand scheme of things at Penn State. He’s merely a man who took on a gargantuan and nearly impossible responsibility – knowing full well he’d never be able to please everyone – and he accomplished some terrific things while also making some big mistakes along the way. The only real truth, as I see it, about Joyner is this: He has never and will never be given a fair shake by a vast number of Penn State people who view him as nothing more than a traitor and as someone who was never qualified to take on the job of athletic director at a major university in the first place. It doesn’t matter one bit to people who hold that belief that Joyner, who is retiring, actually did a good job in a lot of ways in his 2 years as AD. What matters to that camp is that he was on the Board of Trustees that fired Joe Paterno, branding Joyner forever as some sort of evil conspirator. People are entitled to their opinions, and the ones who hold that opinion about Joyner do so with immense passion and resolve. But for anyone else who is trying to formulate an objective opinion about Joyner’s work and legacy at Penn State, let’s start with the fact that he was at least partially responsible for hiring Bill O’Brien and largely responsible for hiring James Franklin. Those have been widely praised as two of the best college football coaching hires in the entire country the past few years. 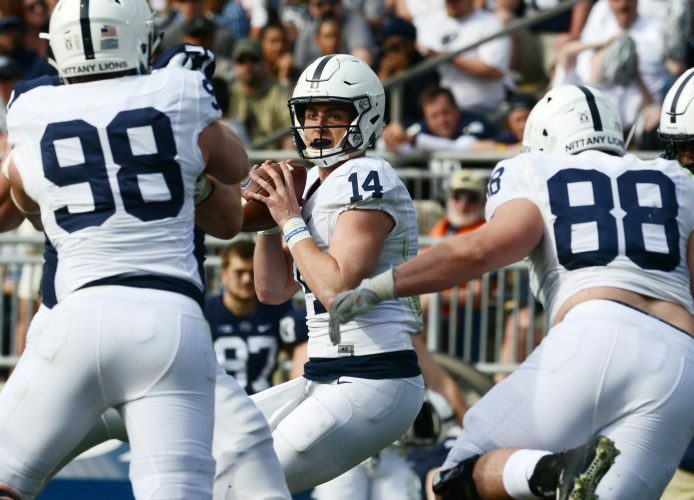 O’Brien was a no-name candidate who turned out to be a savior in many ways for PSU football, while Franklin was the hottest college candidate in the country when he was targeted and lured to Happy Valley by Joyner. Let me submit that, all things being equal, almost any other athletic director in this country would be exalted for making not one, but two home run hires in such a short period of time. But all things aren’t equal when it comes to Joyner, who has been a lightning rod for criticism since the day he became acting AD in the aftermath of the Jerry Sandusky scandal. It’s not just about his ties to the Board of Trustees and role in the Paterno situation, either. Joyner has ruffled a lot of feathers in his time as AD. He can be condescending and arrogant, his critics say, which has not sat well with some, especially the ones who believe a surgeon without college administrative experience had no business being named AD. Some football players didn’t like him, most notably former star linebacker Michael Mauti, whose run-in with Joyner at the time surrounding Big Ten media days two years ago was well-chronicled in a book. There’s an ongoing and messy legal situation involving longtime fencing coach Emmanuil Kaidanov, who was fired by Joyner and has since sued both the AD and the school. If Kaidanov wins, that certainly will look poorly on Joyner. There were strong indications that O’Brien didn’t care much for Joyner near the end of his tenure as football coach. O’Brien famously said he never wanted to be the “unity coach” and was always looking for others at the university to help in that regard, but Joyner’s lack of experience as a college administrator probably failed him when it came to providing more leadership in that realm. There also are some who blame Joyner, at least in part, for O’Brien leaving, saying that if the two didn’t have a strained relationship that the coach would have stayed. I just don’t buy it. O’Brien was always going to leave for an NFL job because, as everyone knew, he’s an NFL coach who didn’t like a lot of the things he had to deal with in college. If Joyner didn’t want to meet all of O’Brien’s demands to stay, then I say good for Joyner. He also knew O’Brien wanted to be an NFL coach, and there was no way Penn State should have to be held hostage at the end of every season waiting for O’Brien to get the pro offer he liked. O’Brien left, Penn State moved on, and Joyner was able to knock it out of the park once again by hiring the recruiting machine Franklin. That decision, if it works out as well as PSU fans hope, could give Joyner a lasting legacy of great success. Something tells me, though, that even if Franklin were to win a national title, a large contingency of Penn State fans will still refuse to give Joyner any credit whatsoever. Which just doesn’t make any sense. College football is so important in this country and generates so much money that, regardless of how good of a job an athletic director does in every area, he stands to get fired if he makes a bad decision on a football coach. Fans generally don’t care if an AD is smarmy or arrogant. Or if he fired a fencing coach for controversial reasons. Or if he once had a failed business venture, which for some ridiculous reason many PSU fans seem hell-bent on holding against Joyner when in fact it should barely even register as an issue. But Joyner is not judged the same way other ADs are judged. In the bizarro world he lives in, he made two great football coaching hires and yet is picked apart by critics for all sorts of things that usually don’t amount to a hill of beans at other schools. Penn State’s next AD might be the most qualified administrator in the history of college sports, someone everybody loves. But I can guarantee you that if Franklin leaves in a few years and the new AD makes a bad coaching hire who fails to win games, then fans will be screaming for the AD to be fired. Joyner’s other successes at PSU include: helping persuade women’s basketball coach Coquese Washington to stay put and extending her contract; overseeing the school’s highly successful transition to Division I hockey in a new arena; and he was in charge of an athletics program that recently finished second in the nation in the Learfield Sports Directors’ Cup standings. Oh, but critics say PSU is such a special place that it accomplished all of those things not with Joyner’s help, but in spite of him. Joyner hasn’t been a great athletic director for Penn State. But he hasn’t been terrible, either, as some so desperately want to argue. Like so many issues that came out of the Sandusky scandal at PSU, things aren’t just black or white, but instead are filled with many shades of gray. Somewhere in there lies Dave Joyner’s true legacy as athletic director.